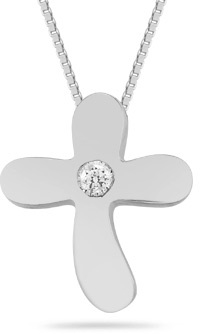 A beautifully designed and trendy small diamond cross pendant in 14k solid white gold, set with 0.05 carat diamond. Cross measures 1/2" in size. Includes 18" 14k gold chain. We guarantee our Small Diamond Solitaire Cross Pendant in 14K White Gold to be high quality, authentic jewelry, as described above.